Use the legend above to determine the symbols on the maps. Most cemetery locations and schools are marked. Use your browser's BACK button to come back to this page. The links below bring up the whole township. Volunteers Who Transcribed The Names. 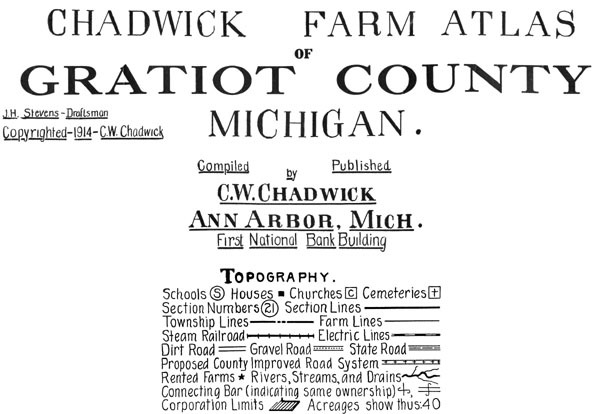 The links below bring up township map image. Seville Township Pat H. Pine River Township Pat H. Bethany Township Martha W. Wheeler Township Jeff L.
Sumner Township Pat H. Arcada Township Pat H. Emerson Township Martha W. Lafayette Township Jeff L.
New Haven Township Kevin E. Newark Township Scott H. North Star Township Martha W. Hamilton Township Jeff L.
North Shade Township Scott H. Fulton Township Scott H. Washington Township Martha W. Elba Township Jeff L.